Well, it's about that time to pack up and bid you a (brief) farewell for the holidays. What holiday sweetness do you have planned for your nearest and dearest? I'm busy crafting as many homemade things as I can from materials I already have on hand. Well, I should say that I'm busy "planning" as many homemade things as I can. I haven't actually done too much. As far as Matt goes, I'm signing him up for a woodworking class; it's something he's been talking about wanting to learn for a while. Pretty soon, we'll be off on our holiday adventure. We have quite the itinerary planned for ourselves. First, we're driving our bloodhound (and maybe our chickens? What do you think, Mom?) to Tampa, Florida, to see my family. Then we fly to Bloomington, Indiana, to see Matt's family. We'll be back in Florida to attend a friend's New Year's Birthday Party. And then we pack it all up and head back home. So, blogging is not on the docket for now, but I promise to be back in January! In the meantime, please feel free to e-mail me your ideas for posts. I'm always eager to hear from you! Wait for an opportune time to discuss issues. You see, I believe in authentic communication. I believe in telling others how I feel, when I feel it. However, I'm slowly starting to realize that I can tell others how I feel in more or less strategic ways. Case in point: If Matt repeatedly presses the snooze button and then can't take the dog out for a run before work (like we've agreed to), it makes no sense for me to vent my frustration in that moment. He's already late for work. Even if the conversation goes my way, Matt still won't be able to take the dog out. What's the point of getting into a messy, adversarial discussion? In fact, why do I even need to vent my frustration if it happens once? If it happens repeatedly and I feel like it's a problem we should address, then it makes sense to wait until we are in a relaxed place. Neither of us is in a relaxed place as Matt is rushing out the door. It sounds so simple as I'm saying it now, but I swear it feels much more complex in the moment! In the moment, I'm frustrated that he's not holding up his end of the bargain, and I feel obligated to point it out. (And even though I'm using an example of how Matt makes me angry, there are plenty of examples of it happening the other way around!). I'm slowly realizing, though, that the conversations go much, much better if we talk about it at a later time. If we come back to it later, it's easier to look at the situation as a conversation to have rather than an angry fight to win. Sometimes, after I save the issue for later, I realize I don't even need to bring it up. I'm over it (which reminds me of my friend Camella's advice that Matt put into our pre-wedding video). Reader Question: I'm thankful to have supportive parents who are much more concerned with my long-term happiness than they are with flower arrangements or wedding etiquette, but the guest list is still so hard to control. My mom is completely laid back about the whole wedding thing and would be completely happy with whatever we choose, but my dad has been waiting since the day my older sister was born to walk just one person all the way down the aisle (he walked a couple of my stepsisters part way -- their dad walked them part way and then my dad met them half way up the aisle and all three proceeded the rest of the way) in the presence of his immediate family. Trouble is my dad is the third of six kids, and I also have five stepsisters. Add spouses and that's already 20 people. If you add kids it just starts to spiral out of control. In theory, my beloved and I both want a small inexpensive wedding, but it means so much to my dad, and even without inviting any cousins, nieces or nephews, I have 25 relatives on my side. The sad part is that I am not very close at all to the vast majority of them, whereas I do have about 20 close friends who really are family to me. Sigh. If anyone has any creative words of wisdom for keeping the wedding guest list down and still keeping my dad happy, I'd be grateful to hear them. I echo your sigh. The guest list can be quite a conundrum. First and foremost, I think it's important to identify what your target number of guests is and why. For example, if you want a smaller wedding in order to keep down the cost, then one solution would be to suggest that your dad cover the cost of the additional guests he is pushing to invite. However, if you want a smaller wedding because you want to surround yourself with people who truly feel like home to you, then I think you need to stand your ground (for the most part). It's your moment of commitment and celebration; it's only logical that you should decide who is there for it. I say "for the most part," because you do want to maintain good relations with your family, and a little compromise may be necessary. Maybe you invite your parents' siblings but make it clear that the buck stops there (i.e., none of their children, etc.). Or perhaps you can encourage your family to host a "wedding reception" completely separate from your actual wedding and reception. 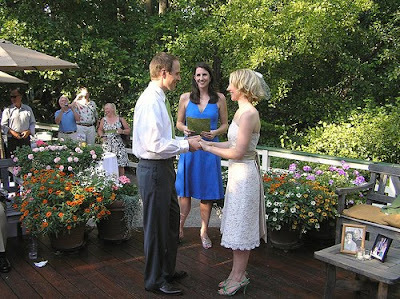 That way, they could control the guest list, and you could have an additional opportunity to connect with people and celebrate, without compromising the kind of wedding you and your partner want. As far as I can tell, there are no easy answers (isn't that often the case when it comes to family relationships?). Matt and I debated the guest list with our families. In the end, we were glad that we invited uncles, aunts, and cousins, even the ones we weren't as close to. It gave us a chance to strengthen those relationships. But we were also glad that we stuck to our guns (e.g., we didn't let guests of guests invite guests, and we didn't invite family friends that we haven't spoken to in years). It's a balance for sure. Everything in moderation. Now I'll open it up to 2000dollarwedding kindred spirits. Any other words of advice? 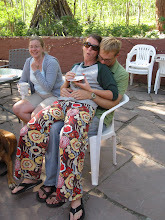 I don't mean to freak out all of you folks who are wedding planning by chatting about babies. 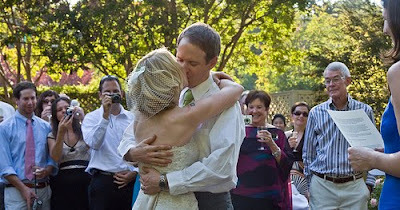 But I'm going to do it--if only for a minute (it will ultimately relate back to weddings--I promise!). Matt and I are thinking about trying to get pregnant next summer. Since I'm a habitual planner, I've started reading books about how to prepare one's body for conception (yes, months and months in advance. I'm a dork. I know.). Basically, it boils down to this: start eliminating unhealthy habits and beef up on your nutrition, which is good advice for anyone, no? I'm not an advocate of the lose-weight-so-you-can-fit-in-your-wedding-dress-and-look-good-in-the-photos approach to weight-loss before a wedding. However, I don't see anything wrong with using an upcoming major life event to provide a little motivation to healthify one's life. The trick, however, is to use the external motivation to make an internal, lifestyle change. Weight-loss is not something you can achieve, pat yourself on the back, and go back to your old ways. In general, I maintain pretty healthy habits. I don't smoke or do drugs. I rarely drink alcohol. I don't ingest much caffeine. I try to avoid medications. I drink a lot of water. However, Matt and I do eat out too much (and I never practice portion control when we do), and I eat a lot of sugar (cupcakes, brownies, ice-cream, etc.). Because of my new health kick, I'm trying to fulfill my daily requirements for protein, calcium, fruits, vegetables, and grains. It's hard to do (especially as a vegetarian). 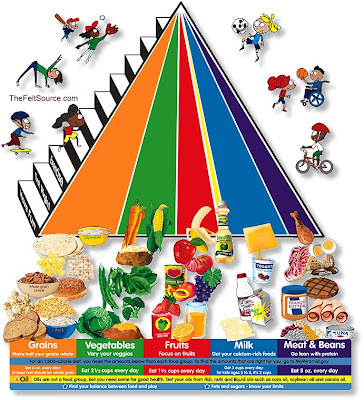 The upside of trying to follow the good ol' food pyramid is that I have way fewer cravings for junk food. Maybe it's because I just started this new health kick, or maybe it's because my body is satiated in other ways. I find myself thinking, "Why would I waste a snack on something that doesn't contribute to one of my required servings?" With a well-rounded diet (plus a multivitamin), I find myself feeling a lot better. It's a commonsense approach, but I don't hear enough about it in conversations about health and wellness. What about you? Has anything inspired you to focus more on health and wellness lately? This letter from Maureen reminds me that planning a wedding doesn't have to make you wanna poke your eyeballs out or stab someone with the nearest sharp object you can get your hands on. 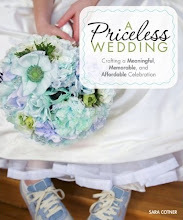 You can have a pretty dress, invitations, a wedding cake, a guest book--etc.--without making it about those things. For example, the cake can crack on your wedding day (um, no joke), and you can solve the problem with a few extra flowers. And, regardless of what The Knot says, you can, in fact, come in under budget. Thanks for sharing your story, Maureen! 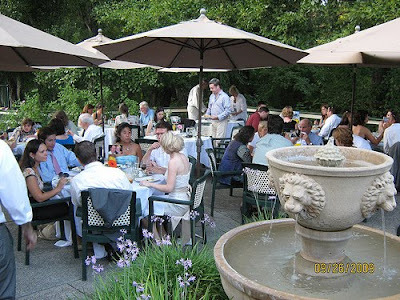 Since we are both transplants to the San Francisco Bay Area and are in love with wine country, we more or less wanted to invite our families and friends from all over the country to a barbeque in a beautiful outdoor setting that also just happened to include a short marriage ceremony. The most important part for us was to get our family and friends together in a place where everyone would be comfortable and have fun. A winery was way out of our budget, but we stumbled across this restaurant with a large outdoor patio at a really reasonable price. The only hitch was that we had to use the restaurant to cater the food, but they had a great selection so we found food that was tasty and affordable. A friend of ours was sworn in as a deputy marriage commissioner for the day and conducted our ceremony for us. Everyone just stood around us and apparently there was traffic noise and a chainsaw started up during Dave’s vows, but we could hear each other and it was meant for us. As part of the ceremony we expressed to everyone there how important their contributions to our lives are. I’ve also included the ceremony script if you want to add it to your collection! 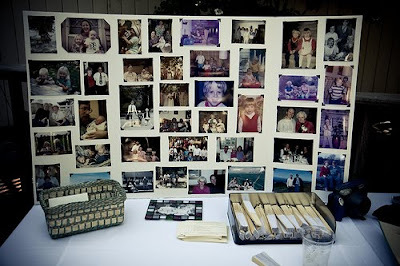 DIY / DIT projects included my veil, the guestbook, the photo-album board, the photo stands on the tables, flower centerpieces and our ceremony script. 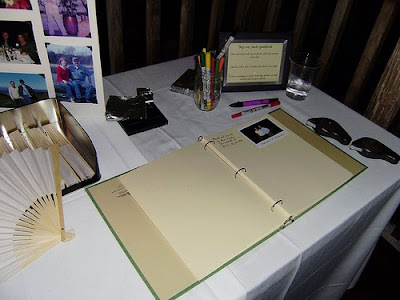 The guest book was just a cheap three ring binder I covered in paper and put some hole-punched card stock into. We got a Fuji instax camera and people took photos of themselves and wrote us little notes. 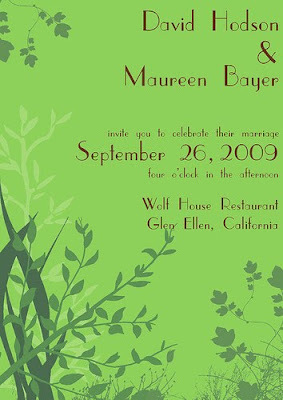 We sent email save the dates then my brother (a graphic designer) and I collaborated to make postcard invites. I found a local carbon-free print shop who used 100% recycled paper (www.greenerprinter.com) and they ended up being very affordable and much easier than wrestling with our home printer. As opposed to hiring a photographer, we asked everyone to bring their digital cameras and purchased a flickr account. My brother has a nice camera and rented a special lens for the day. A lot of folks took photos and we ended up with more than 500 in our flickr collection - all for the cost of a one year account! 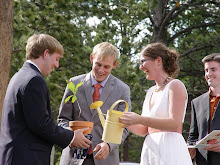 While we didn't get any "formal" photographs, the candids are awesome and some are hilarious. I would definitely do this again if I had it to do over. On our tables were plain white tablecloths which were included in the price of the venue and then we found this green Napalese paper with a white flower print that we put in the center of each. The patio chairs were included as well, though I guess most people rent white ones. I really didn’t care what color the chairs were. My mom and I worked to collect a bunch of antique milk/cream bottles and put a few local organic gerbera daisies in each one. The flowers were a great deal - we got 45 for $30 or so. I used beeswax candles in small votive holders for a little ambiance. I found a $200 dress (new) online that was summery, casual but still looked weddingy enough. Its actually a bridesmaids dress. I found a great local seamstress to do the required alterations. I made my veil out of french net and ribbon that we also used on the cake. I had my makeup done at a counter in the mall for free (included with purchase of makeup), my friend Kristen did my hair and I wore my grandmother’s necklace. Dave just wore a suit and shirt that he had, but since it was so hot the tie and jacket were shed pretty quickly! Our cake was from a local baker. It was 104 degrees that day and we had my aunt and uncle bring the cake up in their car, but it suffered a major crack on the way. Luckily we had some extra flowers and no one knew the difference! 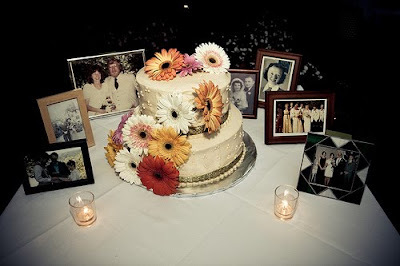 I printed photos from our parents and grandparents weddings and surrounded the cake with them. 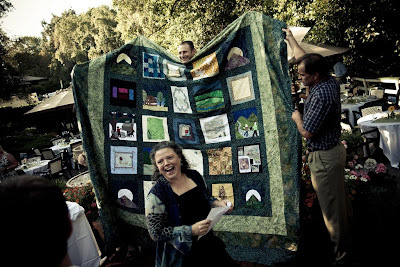 My mom contacted all of the people we invited and asked them to make squares for our wedding quilt. It was a complete surprise revealed just after our vows. 20 family and friends contributed squares. We wanted to spend under (far under) $10,000 and ended up around $8,000, which is a lot for only 65 guests. The food and bar bill really hurt us. But we saved money in almost every other area, so ended up feeling very good about it. 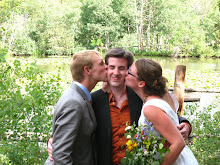 What’s most important is that we had a very meaningful and memorable wedding and everyone had fun!